The purpose of the Age-Friendly Committee is to help “connect people 60 years plus with people of all ages in order to decrease social isolation and to increase access to services, social opportunities and recreation.” Meetings are usually held at City Hall the Monday of the month at 4 p.m. The seven-member Board of Adjustment is designed to “review and approve or deny variances from zoning ordinance requirements and administrative decisions which create hardships in the development of property due to exceptional or extraordinary conditions.” With such a specific purpose, the BOA meets on an as-needed basis, typically on a Tuesday or Thursday evening at City Hall. 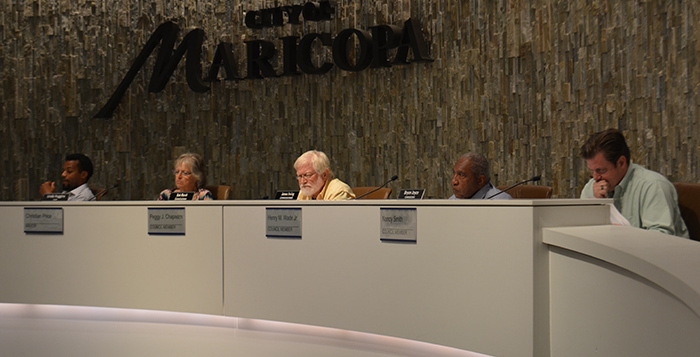 The seven Cultural Affairs Advisory Committee members are tasked with helping “promote an environment that fosters diversity and inclusion within Maricopa.” Regular meetings are typically held the last Thursday of every month, and special meetings are held to address important, time-sensitive matters. Their meetings usually take place at City Hall, with special meetings sometimes happening at Copper Sky Recreation Center. The seven-member Heritage District Advisory Committee is responsible for bolstering the success of the Heritage District Area Plan. The group assists and advises the city council on issues relating to the city’s historical neighborhoods. They meet on the second Thursday of the month. The seven members of the Parks, Recreation and Libraries Committee assist the Community Services Department in developing quality programs to meet the community’s recreational needs. They help with general park design to the planning of special events. The committee meets on the last Wednesday of every month, typically at City Hall. The seven-member Planning and Zoning Commission “reviews and makes recommendations on various projects and applications made to the city for legislative action by the city council.” This commission plays an integral role in the community’s development. The P&Z Commission usually meets at City Hall the second Monday of the month. The Veterans Affairs Committee is made up of seven members, both veteran and non-veteran, who help provide area veterans and their families access to resources and benefits information. They help with the “preparation of forms and supporting documentation,” and organize “support events and activities that honor veterans and active military personnel.” Meetings most often occur on the last Tuesday or Thursday of the month.